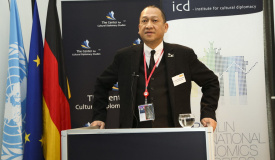 Dato’ Seri Mohammed Nazri bin Tan Sri Abdul Aziz has been the Minister of Tourism and Culture of Malaysia since May 2013. He is also a Member of Parliament for Padang Rengas in Perak since 2004. In 1978 he was elected to the United Malays National Organization (UMNO) Youth Executive Committee and he became the chairman of the UMNO Youth International Affairs Bureau from 1986 to 1996. 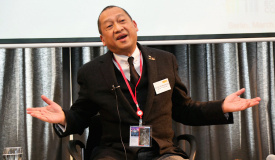 Dato’ Nazri then became the Chairman of the Youth Wing of the Barisan Nasional (1990-994) and has been a member of the UMNO Supreme Council since 1990. Dato’ Nazri then became the Deputy Chairman of UMNO Youth in 1993 and Acting Chairman from 1994 to 1996. In March 1993, he was appointed Chairman of Majlis Amanah Rakyat (MARA), a position he held until July 1995. In 1991, Dato’ Nazri Aziz was appointed Senator but resigned in 1995 to contest for the Chenderoh seat in the general election that year. 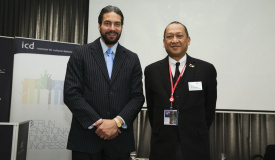 Winning the election, he was appointed Deputy Minister in the Prime Minister's Department. Dato’ Nazri briefly became Deputy Finance Minister II, after winning the 1999 general election, before being appointed Minister of Entrepreneurial Development as a result of a cabinet reshuffle in December. Before becoming the Minister of Tourism and Culture of Malaysia, Dato’ Seri Mohammed Nazri bin Tan Sri Abdul Aziz was the Minster In-charge of Legal Affairs and Judicial Reform in the Prime Minister’s Department. Dato’ Seri Mohammed Nazri bin Tan Sri Abdul Aziz studied at Malay College in Kuala Kangsar. He was called to the bar at Lincoln’s Inn after obtaining his law degree.